I was never really The World’s Greatest Chocolate Lover. I liked it but my snack of choice was usually something savoury, if out at a restaurant I would never pick a chocolate dessert over something fruity and I would never find myself making chocolate cake unless it was by request (always from my boy). But over the last few years this has slowly been changing and now I find it hard to turn down a bar of Green & Blacks and I absolutely cannot resist temptation in the form of a warm chocolate brownie especially if bathed in hot chocolate sauce and served with a scoop of cold creamy vanilla ice cream on the side. Luckily for me this is also my son’s absolute favourite dessert in the whole wide world so when it is his turn to pick what we make for dinner I can rest assured that I am in for a treat too. 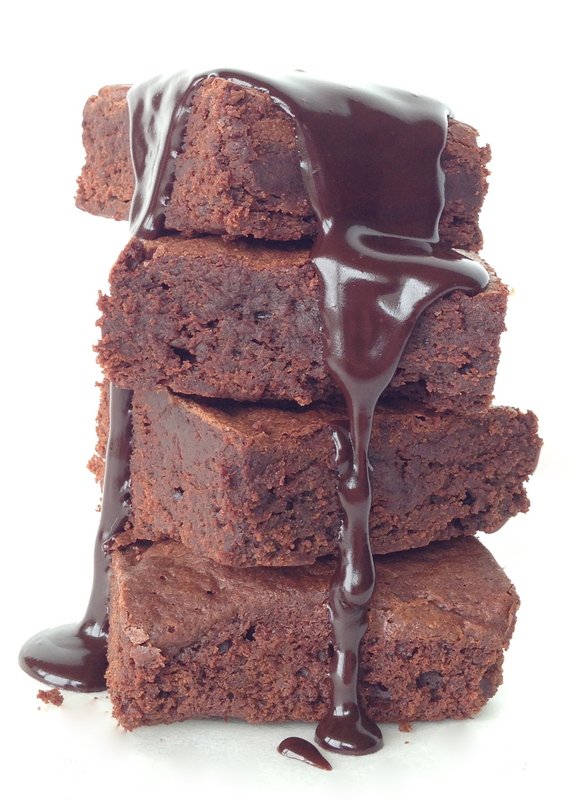 My favourite recipe for brownies is this one from River Cottage Family Cookbook and I make just one teeny adjustment in that instead of using all dark chocolate, which is a little bit too bitter for my son’s taste, I swap half for good quality milk chocolate. They are so simple and easy to make, perfectly fudgey and like any moist cake they last really well wrapped in foil for a few days. As for the chocolate sauce, to me this is pretty much the perfect accompaniment and is handy to have in the fridge to warm through and pour over ice cream even when all of the brownies are gone. It will solidify when chilled and should last a while – I never really get to test how long as it is usually used up pretty quickly but I would think a couple of weeks at least. Boil the kettle and preheat oven to 160°C. Line a baking tin with foil (I use an 8″ x 8″ square tin). Break up the chocolate and put it together with the cubed butter in to a medium sized bowl. Place the bowl over a pan of simmering water (making sure the bottom of the bowl does not touch the water), turn off the heat and leave to melt completely, stirring occasionally. In another bowl whisk together the sugar and eggs until smooth and then add in the melted chocolate-butter mix and stir until well combined. Sift in the flour and cocoa powder and mix together ensuring that all of the ingredients are thoroughly combined. Then pour the mix in to the foil-lined tin, smooth the top and bake in the oven for 20-25 minutes. The top of the brownies should be a little cracked and paper-like and inside should still be a teeny bit gooey when tested with a knife. Leave to cool slightly before cutting into squares. Put all of the ingredients in to a small pot and heat gently on low, stirring throughout with a whisk until all of the butter has melted and the ingredients are combined. Continue to heat until the sauce thickens slightly and is smooth and silky. If re-heating the sauce from chilled place in a small pot and warm through very gently. I would not recommend heating in a mircrowave. Why thank you Conor 🙂 they look even nicer on my plate with ice cream. oohhh your back !!! I just popped in here for your sausage recipe….yes we are still making your sausages here in Boston ! I have a gang coming over for dinner and to watch a hockey game so whats better than sausages and beer !!! I am delighted to find new posts and am looking forward to reading again . Hi there! Thanks so much for saying hello 🙂 hope life is good for you over there?